Since a German technician developed a ´miniature´ camera for the 35mm cine-film in the first half of the last century, many camera manufacturers followed with an similar design. The first Nikon rangefinder camera was more or less a copy of that German invention. The first Nikon single lens reflex camera, the Nikon F, is in fact a rangefinder camera fitted with a mirror house and eye level view finder. And the first digital reflex camera is almost a copy of one of the last film SLR´s Nikon made. If you would open the Nikon D1 you´ll find the film compartment intact. Many manufacturers have shown that the shape of a modern digi-reflex camera doesn´t need to follow the classic film SLR design. Nikon Corporation - however - is one of the conservative camera makers´ herd. It is not necessary to use a mirror house, or to place the sensor in line with the lens axis, or to build a camera as heavy as a brick and as big as a shoe box. Digital technology makes it possible to create an image taker (´camera´ isn´t a proper name anymore) with a better grip, giving space to our nose and eyes so we can press the IT at our cheek for better stability, or - like mounted on modern movie cameras - fitted with a moveable viewing tube. As you will see in this chapter Nikon digital SLR´s do have the same shape as their film cousins. All made for right-handed people only, but luckily with the F-mount enabling to use nearly all Nikkor lenses. Before Nikon introduced a professional digital single lens reflex (SLR) camera other manufacturers produced digital cameras on basis of a Nikon film SLR. Cameras have been made by Kodak, Fuji and others on basis of the Nikon F3, F4, F5, F-801, F-90, Pronea, etc. Some in cooperation with Nikon, some not. More info about the Kodak and Fuji SLR's can be found here. The very first digital SLR prototype (with a 1.6/6 mm. lens), produced by Nikon Corporation, was shown at the 1986 Photokina Exhibition in Germany, followed by a serious ´Still-video´-camera, the Nikon QV 1000C in 1990. This very expensive - and nowadays rare - camera has a 2/3 inch CCD with maximum resolution of a mere 380,000 pixels and a separate lens mount. At the time of its introduction the camera had the world's highest ISO-setting of 1600 ! It was able to register images at the ESCC-standard in Single mode, Continuous mode ( 4 fps) and CH (20 fps) at 1/1000 sec. when the mirror was locked up. Shutter speed range is 1/8 - 1/2000 sec. Additionally a photo-transmitter (QV-1010T) was supplied. 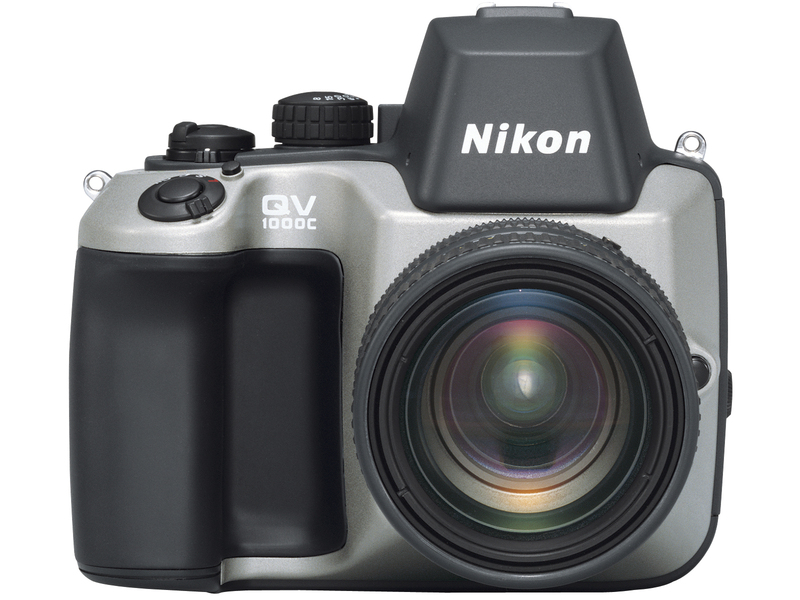 See here for more info about the QV-Nikkors. All Nikon digital SLR´s use either CF or SD memory cards. Not all brands will work, so look into the manual of the camera. Format the card - before use - in your camera. The D1-series internal software runs in FAT16-modus; they therefore can´t be used with CF-cards with a maximum memory capacity of more than 2 Gb. All other cameras run in FAT32-modus and will take the ´larger´ cards. IBM-mini drives wont fit all cameras as the card port may be too narrow. Nikon Corporation has made very nice digital reflex cameras - as you will see below - and developed its own Nikon Electronic File (NEF), which is an image capture software for the storage of images in RAW mode. Whether you´ll pay 400 or 4,000 Euro or more for a camera Nikon Corporation compels the buyer to pay for extra software (Nikon Capture) in order to be able to manage those RAW-NEF images! Without that software you can´t edit NEF-images. A strange policy, although since early 2008 in many countries a new camera will come with the appropriate software! And: All Nikon digital SLR cameras have a built-in auto focus sensor that will work as long as the lens in use (or a lens-teleconverter-combination) has a maximum aperture of f/5.6 or larger (= lower f-number). When using slower (= higher f-number) lenses auto focus may fail. Newer models (2012+) may be used with lenses with a maximum aperture of f/8 or larger. And (2): for resetting your digital camera to factory specifications see here. And (3): All cameras below have a built-in counter of shutter actuations. If you want to know how much shutter actuations the shutter of your camera has made, download Opanda Exif (for free) and open a JPEG-image, made with that particular camera. In the long list of data somewhere down that list you'll find the number of shutter actuations. All cameras will give these data, except the Nikon D1-series and Nikon D100. If above the line in the Opanda Exif data of shutter actuations two lines appear (OOA5 and OOA6) these data will imply that the shutter has been replaced. The first number (in above picture blue line) will be the total number of shutter actuations of the new/replaced shutter, the second number those of the first/old shutter! The third number is of the grand total of shutter actuations. In the picture above the Nikon D2X of Nico van Dijk has a total of 348,691 (as per June 2016) actuations - and works as it was new! However: some software suggest that the 00A6-number in above picture could be the number of in-camera deleted images. No confirmation so far. And (4): For nearly all cameras Nikon issued firmware upgrades. Firmware type C is for camera settings, firmware type A and B are offered separately but should be installed simultaneously. Firmware type L is for upgrading compatibility of lenses and accessories. You may find out here if there is a firmware upgrade for your camera.